State Reps. Matt Gabler (R-Clearfield/Elk) and Tommy Sankey (R-Clearfield) were on hand Tuesday as Ferguson Township received the Governor’s Award for Local Government Excellence. 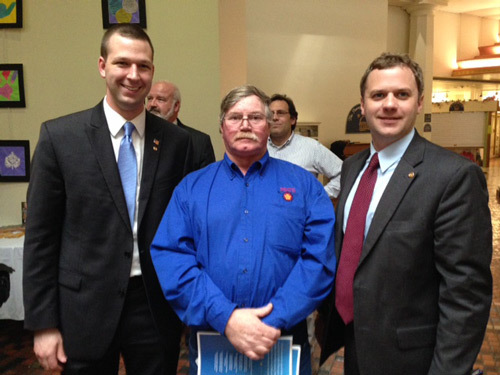 Supervisor Donald Sheeder (center) traveled to Harrisburg to accept the award on behalf of the municipality. Ferguson Township earned the honor as result of its merger with Lumber City, which became official in January. The move will provide substantial cost savings by eliminating duplication of services, and will allow former borough roads to be brought up to code and maintained on a regular basis. Lumber City Borough Council initiated the merger and Ferguson Township supervisors agreed to proceed with the process of having the referendum put on the ballot.